Pompey kitman Kev McCormack has clocked up all of the 92 clubs working alongside Blues stalwart Barry Harris. Last week, we asked Harris his memories of his time in the role. Now it’s Big Kev’s turn in the spotlight. How did the job come about, Kev? Alan Ball was my first manager. He gave me the job. I knew Kit Symons from Wales and when I was boxing for Wales. I was in the Royal Marines at the time and (physio) Neil Sillett wanted me to do extra work with injured players. I did that for a year. Then they asked me to look after the players’ bar with my background. Then Gordon Neave was retiring and I was getting medically discharged from my position. So Bally asked me to come in as a kitman. I asked him what did that entail? He said not to worry and just come in! I walked in and asked Gordon if he was going to show me about. He gave me the keys and said: ‘All the best son!’. He told me three things. He said I’d swear a lot more, I’d be the angriest man in the world and I’d be tired. Within three months I had angry Tourettes and I couldn’t keep my eyes open! There must be a few standout memories now? I remember we were playing Wolves at Molineux and Kevin Muscat went to punch Jeff Peron. We were coming off and he went for him, so I just parted them, shall we say. He had a go at me and I lost my head with him. Bally screamed for me to get in the changing room. It was one of my first games and I thought I was in for a telling off. Bally slammed the dressing door shut and told the players: ‘That’s the sort of aggression I want to see!’. There was Paul Merson when he went off to Barbados in the season. I was in the room when Harry (Redknapp) took the phone call off his mate saying he’d seen him there. Paul was supposed to go to the Sporting Chance clinic for his problems. Harry told him that wasn’t an issue if he was back the following Thursday. He turned up with a better tan than Phil Brown! But Harry didn’t say anything to him and he then turned in that performance in the 5-0 win at Millwall. The only thing the gaffer said afterwards was: ‘Nice tan Merse!’. Did you keep hold of Robert Prosinecki’s cigarettes for him? I used to have a fag lit for him before the game, half-time and on the final whistle! Prosi liked a fag. What’s your best away kit? The gold one. We got promoted in it and I can hardly remember us losing in it, to be fair. And the best thing you’ve been given? Avram Grant gave me his FA Cup medal in 2010. He pulled me and said I was one of the best kitmen he’d worked with. That meant a lot. Who’s the favourite player and manager you’ve worked with? I loved Bally to bits. Then there was Harry and Avram. To be fair, I got on with most of them. I’m a likeable guy! Prosinecki has to be the player. There’s a few, though. David James was brilliant to us and paid our wages one month when we didn’t get them. Then there’s Linvoy. There’s been loads over the years. And we have to leave the final words for your partner in crime. I’d be lost without Barry. The bloke’s a Pompey legend. 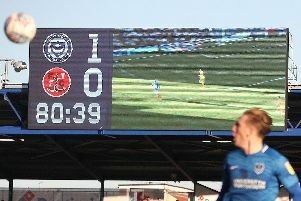 He loves Pompey with all is heart. I’m proud to call him a friend.